The Eurasian Curlew has long been a familiar sight on estuaries and saltmarsh in winter, and on its moorland breeding strongholds in summer. The species, however, is currently declining at an alarming rate in the UK, earning it the dubious title of being our ‘most pressing bird conservation priority’. Mary Colwell describes her personal journey to raise awareness about the plight of the species, while Alan Lauder, Anita Donaghy and Barry O’Donoghue discuss the conservation of curlews in Ireland. My Curlew year began in January 2016, when I was standing alone in the cold and rain by the edge of the sea in Norfolk, watching Curlews feed on the mud of The Wash. It ended in November, at a smart golf club in central Ireland, surrounded by like-minded numeniophiles. How do I read the full article? If you take out a new subscription to British Wildlife, you can request any two available back issues as your free gift. Alternatively, you may find the article in your local library. Many libraries across the UK have a subscription to British Wildlife, including those of trusts, societies, and public and university libraries. Why is British Wildlife not available online? We do not offer electronic subscriptions to individuals, as there is no sustainable revenue model for this. We are also unable to provide pdfs of individual articles. 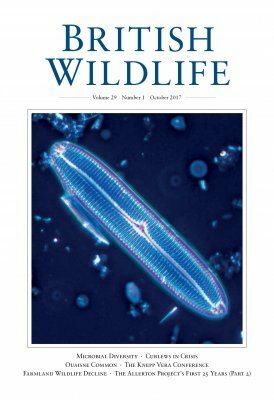 Subscriptions to British Wildlife start from £25 a year for six issues, all new subscribers receive two free issues of their choice.